Happy New Year from everyone here at Helmar!! We wish each of you a happy and prosperous 2014. It's Tracey back to share a project I created to go with one of my New Year resolutions. 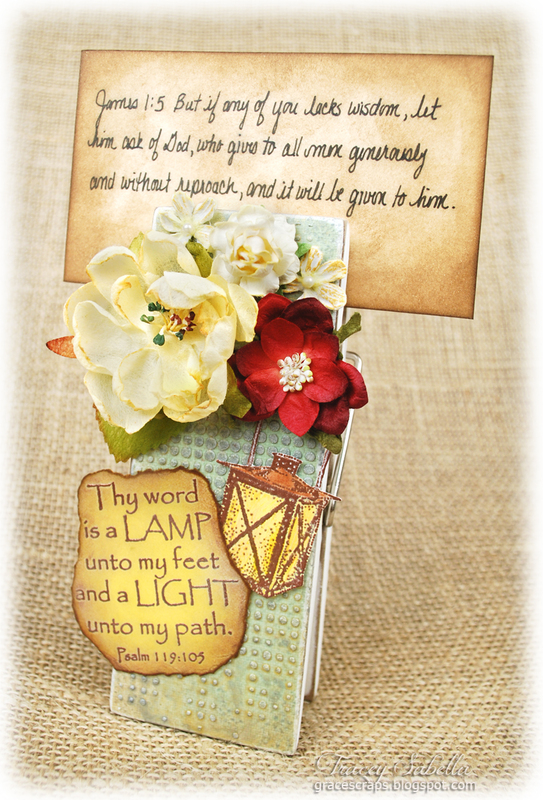 This year I'm looking for ways to learn more Scripture, so I created this lovely card holder for the window ledge above my kitchen sink. I'll place special verses there to think about and learn as I work. This would make a great recipe holder as well. 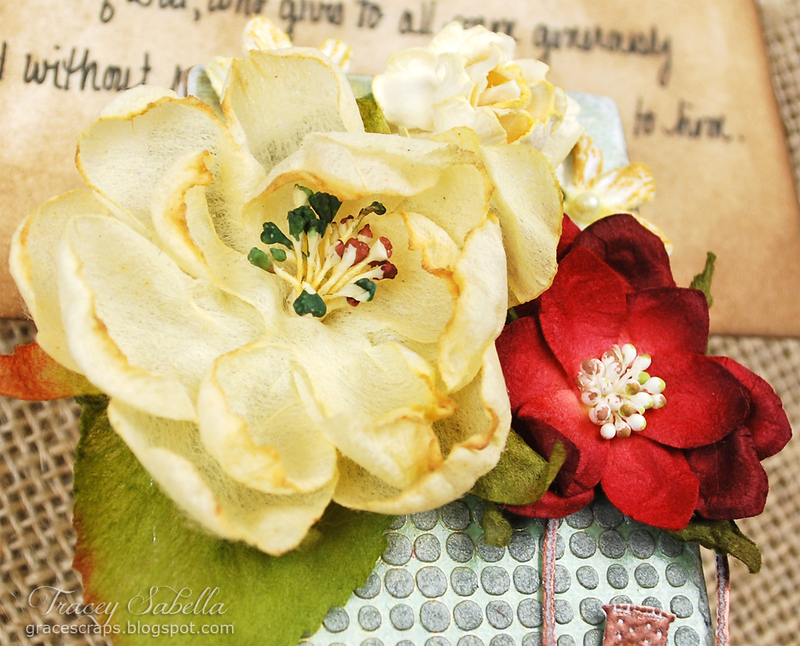 I've used Helmar Decoupage & Craft Paste to adhere and seal my background papers. I found this giant clothes pin on clearance after Easter last year. It was decorated with some "lovely" cartoon Easter bunny paper. I peeled off the paper and sanded to get a smooth finish and also sanded all the painted edges to distress, revealing the wood below at all the edges. Once all my sanding was complete, I cut sections of cardstock weight patterned paper by Prima just a little larger than the flat panels on the clothes pin base. I brushed just the wood panels with Decoupage Paste then laid the paper pieces onto the decoupaged wood. I rolled over the paper with a brayer to make sure it would be completely adhered without any air bubbles below. Here's a hint when using a brayer. I laid a sheet of computer paper over the patterned paper before using the brayer to make sure I wouldn't leave markings or transfer stray bits from the brayer. When this was completely dry, I trimmed close and sanded the edges to distress so the paper blended right into the wood edge. Then I brushed more Decoupage & Craft Paste over the top to seal the paper beneath. Since I plan to use this in the kitchen I want a nice sealed surface to protect the paper from splashes. Set aside and allow to dry completely. When dry, I applied molding paste with a dot fade stencil, then used tinsel and gold Color Shine mists to add shimmer and drips. When this was dry, I sprayed with Helmar Crystal Kote Gloss Varnish. 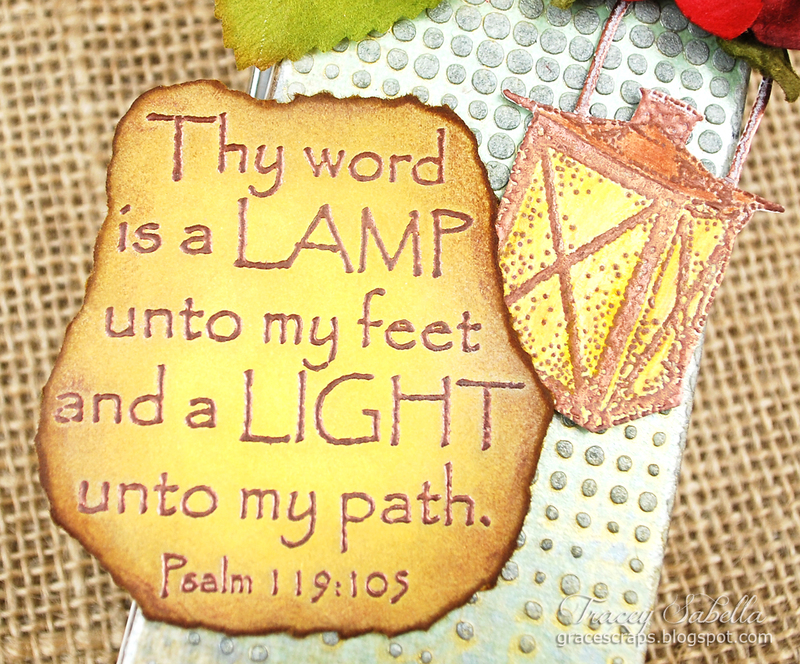 I stamped and heat embossed my sentiment and lantern, then colored with inks and watercolor pencils. I wanted to seal these to protect against those kitchen splashes, but didn't wanted to keep a natural finish to contrast against the glossy background, so sprayed with Helmar Crystal Kote Matte Varnish. 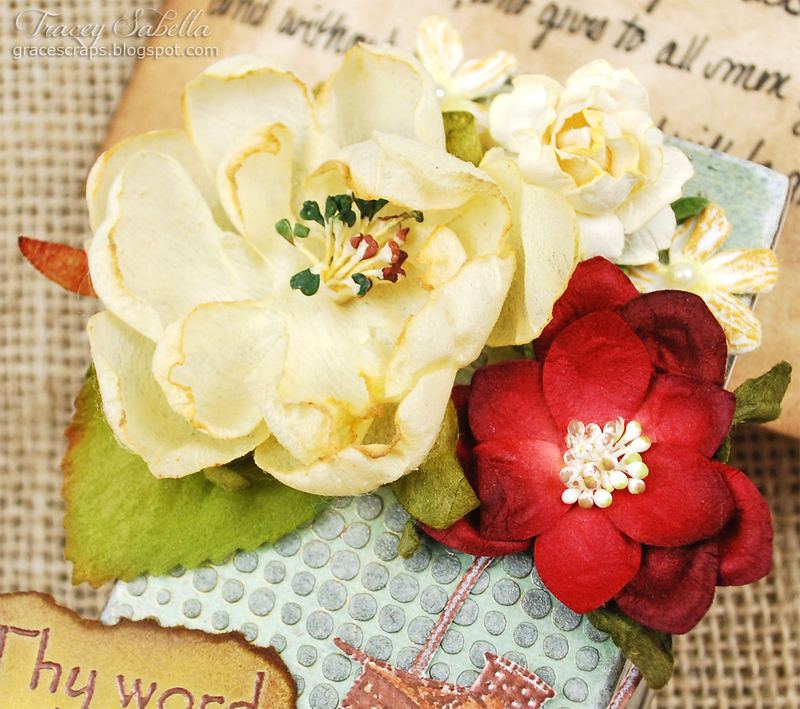 Finally, I selected some gorgeous flowers and arranged my elements onto the clothes pin. Everything is adhered into place with Helmar 450 Quick Dry Adhesive, which is my favorite go to adhesive when adhering to a mixed media surface. mixed media project using Helmar's Decoupage & Craft Paste. With New Year's Eve almost upon us I thought I make up some quick and easy DIY party crowns to hopefully inspire you to try you hand at one. I have an added incentive due to the fact that my daughter's birthday falls on New Year's Eve, and let's face it, all girls love to be a princess!! I've put together two headband style crowns and one lace crown. Firstly I will give you the instructions for the lace crown. Using Helmar's Fabric Stiffener and Draping Liquid this is a very simple but very pretty crown to create. You will need two bowls, cling film/plastic wrap, lace of choice and Helmar's Fabric Stiffener and Draping Liquid. Be sure to choose a bowl with the circumference as close to the size crown you want as possible. In one bowl place the lace and enough of the Helmar's glue to coat it thoroughly. Cover the second bowl with the cling film/plastic wrap and wrap the coated lace around the base, overlapping slightly. Place on a surface that is also covered with the cling film/plastic wrap to prevent the lace from sticking to it. Set this aside to dry for up to 24 hrs. I did not need this long due to the very hot summer weather at the moment, after a couple of hours it was set enough to remove from the bowl and cling film/plastic wrap and mold into the shape I wanted. I then set aside for another hour for further drying. Once it was completely dry (firm shape but pliable) I could then decorate it. I used some half back pearls and mesh bling to bejewel my lace crown. For my headband crowns I simply used a couple of empty toilet rolls or you could use tubing from any paper wrap you may have available. The first one has a simple 'V' shape cut deeply into the top part and the second one I just cut a 1" section from the TP roll for the base and then with the remaining I cut it into five long strips and a strip was used to make a small circle. Paint all sections in your desired colour, glue the small cirle together using Helmar's Craft Glue and then once dry, attach the long strips evenly. Curl all sections around and attach to the base using Helmar's Craft Glue. Once you have both your crown structures made you can decorate them in any way you wish, for the spiked crown I made a mix of pearls, sequins, beads and glitter and glued to the lower section. I then attached a little tinsel around the base and glued glitter to the spikes. With the other crown I used some mesh bling in strips down each section, a few beaded decorations around the base at that's it. You can glue these directly on to headbands (hair colour is best) using your Helmars glue or you can insert a small strip along the base and glue this to the headband for extra strength. And there you have it, very simple New Year's Eve crowns or they can even be used for birthdays!!! Thank you for joining my today and I wish you all a very safe and Happy New Year!!!! Hi, it's Tracey here to share a new family Christmas tradition I started last year. Now that all of our children are out on their own, I thought it would be nice to create a special ornament for them to help decorate their trees. A friend taught me how to read a pattern to create a lovely crocheted snowflake and a tradition was born. 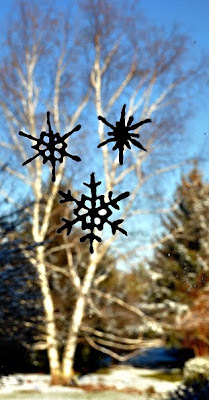 I plan to find a new snowflake to handcraft each year. Of course they must be blocked and stiffened. Helmar Fabric Stiffener and Draping Fluid is the perfect product for that job. 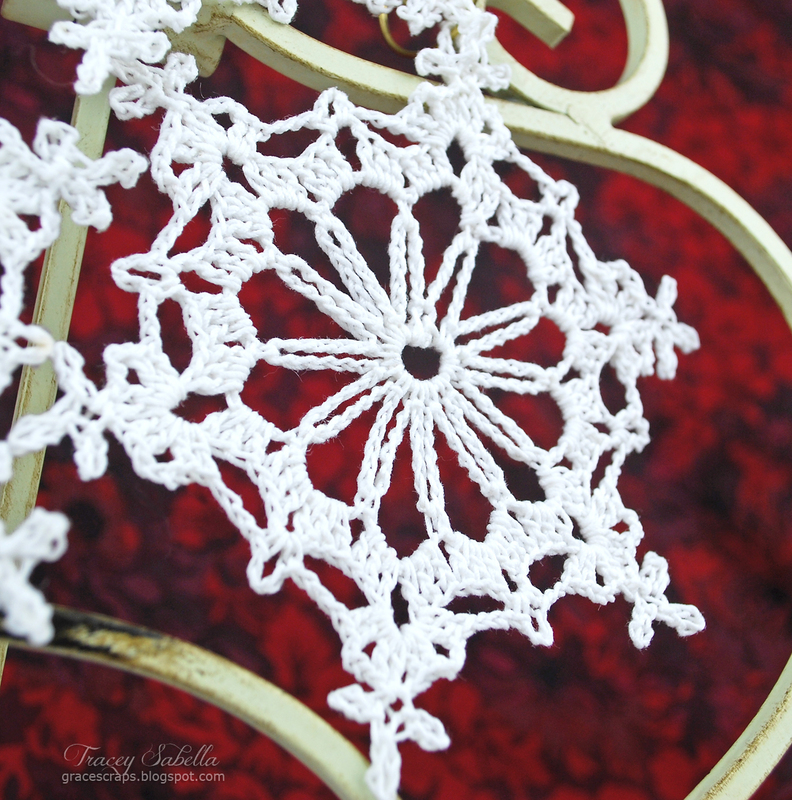 If you don't crochet, you can still create a similar ornament by using the Helmar Fabric Stiffener on a small crochet doily. As you can see with the snowflake right next to the Fabric Stiffener, before stiffening, they are quite soft and crumpled. The first thing I did was to block the ornaments. I have lots of padding on my ironing board, so I laid a dish cloth over the padded board, then a layer of wax paper to keep the stiffener off of the ironing board. Any kind of foam or padded board would also work. Pin the ornament into shape. The stiffener is thick, so I thinned it with 50% water and 50% Helmar Fabric Stiffener. I used a stiff paint brush to apply it to the snowflakes. Be sure to completely saturate. Allow to completely dry. I left mine overnight. Crochet Pattern by Better Homes and Garden can be found here. 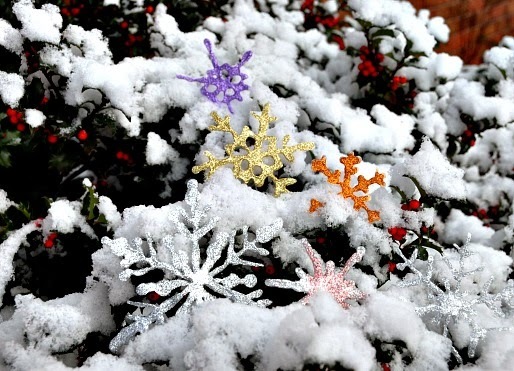 I hope you've been inspired to created wintry snowflakes for your holiday decorating. Ava here today and I am going to share my Christmas ambience tip with all of you. Soon Christmas Day will be here and I think its all about the prep for the holidays that embellishes the big day once it arrives. Here is my tip.... while cleaning the house, while cooking, while baking and finally decorating the house for christmas, PLAY CHRISTMAS MUSIC. My family get's a huge dose of Christmas music the whole month of December which gets everyone into a spirt of the season. "I am dreaming of a White Christmas". Lets get started with the supplies and steps you need to complete this quick and easy Christmas Wreath. Just buy a bottle of Helmar Adhesive and truly, you can bring someone many days of pure joy creating art. The artistic creations are unlimited. Just this bottle of Helmar 450 Quick Dry Adhesive can adhere all the elements onto this grapevine wreath. 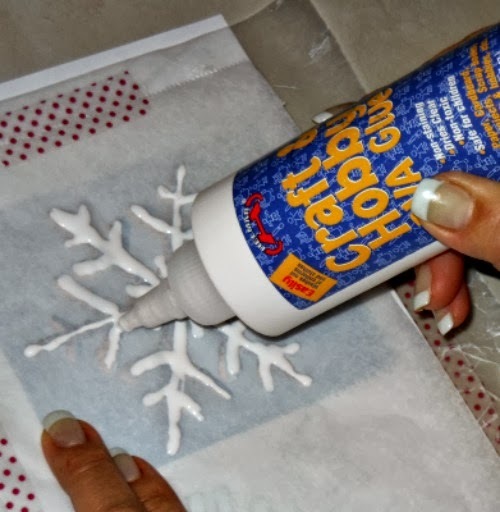 Start with gesso to give the grapevine wreath some snow effect. 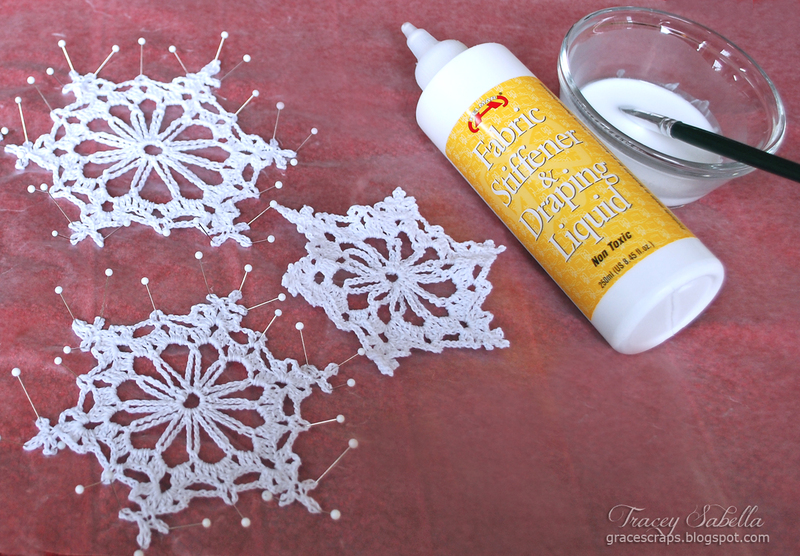 Die cut some snowflakes, leaves and prepare to embellish the wreath. Truly, Helmar 450 Quick Dry Adhesive makes this project come together quickly. Die cut 3 snowflakes, assemble, and glue together. Die cut some leaf branches and adhered elements to the grapevine wreath. "I'm Dreaming of a White Christmas" all the best to everyone. Add some Helmar 450 Quick Dry to your stocking stuffer shopping list. Hi Helmar Fans - it's Christine with you today! Every year for Christmas I try to add a couple of handmade projects to my Christmas decor. This year I decided to create some glitter jars that I could add candles to. These are very easy to do but do take some time to dry. I used up old jars...from canning style to other extras that I had laying around! Pour a little Craft & Hobby PVA glue into the bottom of the glass container. Then use a brush to to very lightly cover the entire inside. Then coat the inside with glitter. Start off with a light layer and then decide if you want it to be more thick. If you allow it to dry overnight it should be well set and ready to use. You can add a variety of items to it but I chose to use mine as candleholders. A perfect personal touch to the holiday decor! And the Helmar Craft & Hobby PVA Glue made it easy! Hello everyone and welcome back to the Helmar Blog. Today we are making something very quick and simple for our Christmas table. start applying the Helmar Foam Glue at the base of the cone where you would like your lace to stick, this glue is ideal for foam products because it doesn't eat away at the foam. Continue applying the glue in a upward circular direction all the way to the tip attaching the lace as you go along. Once you reach the tip with your lace, secure it with a pin and trim any excess. This glue does not take long to dry so once it feels secure, remove the pin. With the addition of a small snowflake, pearl earring and crown charm to complete the look you have a very quick and simple decoration to make for Christmas that even the kids can get involved in. I would also like to take this opportunity to wish everybody a very safe and happy Christmas. Hi everyone, Sandee here, offering up some fabulous words of advice and a few puns for my summer themed project today. The seahorse was part of large chipboard album from Want 2 Scrap. After covering it with Bo Bunny paper and lots of layers from these products came the fun part of embellishing the trunk. This was my first time experimenting with Helmar's Fabric Stiffener & Draping Liquid and I must say I was delighted and will definitely use this again. Not only was I able to mold it to the shape that I wanted ( I laid a piece of wax paper over my sea horse so that I could mold the curve to match ) but after it is treated, you can paint on it and the inks don't bleed like they normally do when applied to fabric. After the lace piece had dried, I adhered it with Helmar's 450 Quick Dry Adhesive. Adding Want 2 Scrap pearls and other decorations with my Helmar's Gemstone Adhesive ; because it does not make the pearls cloudy if you are a messy gluer, and dries to a beautiful clear finish. 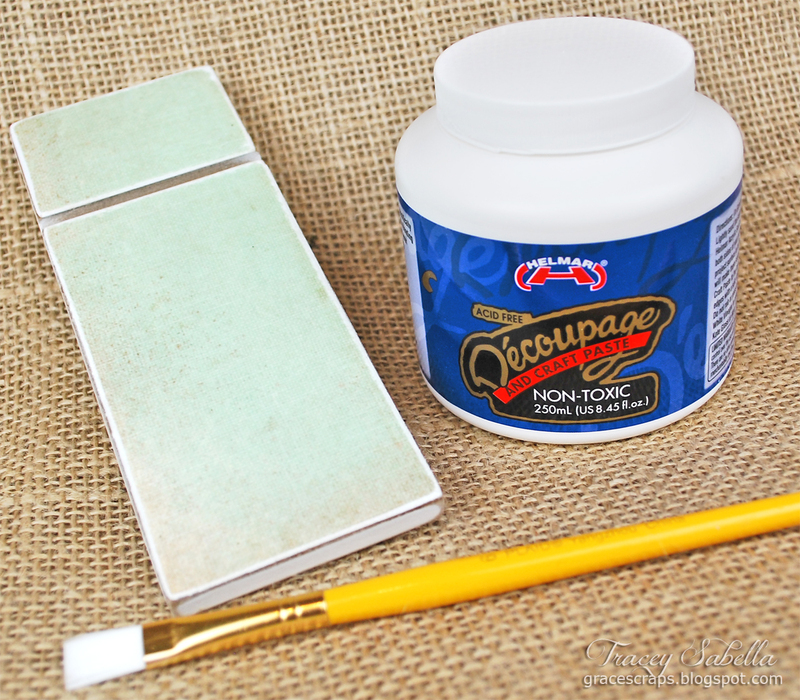 my best advice to you is to use the best glue around for all your projects and crafts! More free stuff coming your way if you are the first to figure this out! 1. You must have liked the Helmar Facebook page. 2. You must share this post on your Facebook page. 4. First correct answer wins. 5. If there is no correct answer by the next Helmar Teaser this prize will carry over additional to the prize for the next Helmar Teaser. 6. Answers must be posted on this post on the Helmar Facebook page. 7. Design Team members current and past are ineligible to enter. There will be an additional hint each day or so until someone figures it out. The prize for this Helmar Teaser is 1 x Helmar 450 Quick Dry Glue 4.23 fl.oz. (125ml), 1 x Helmar Acid Free Glue 4.23 fl.oz. (125ml) & 1 x Helmar Tacky Glue 4.23 fl.oz. I was born in outback Australia and spent my early years on a sheep station. Welcome to the season of Skating, Snowflakes and Hot Coco. Hi, everyone its Ava back to share a fun pin inspired project showcasing the perfect glue for this fun project. Helmar Craft and Hobby PVA Glue is the perfect glue for making fun glitter snowflakes that you can hang in the windows as a home decor item. If you missed team mate Sandee's fabulous Helmar project on October 30th, check it out HERE. Sandee's Halloween project really impressed me so much, I wanted to try out her techniques for my WINTER project. 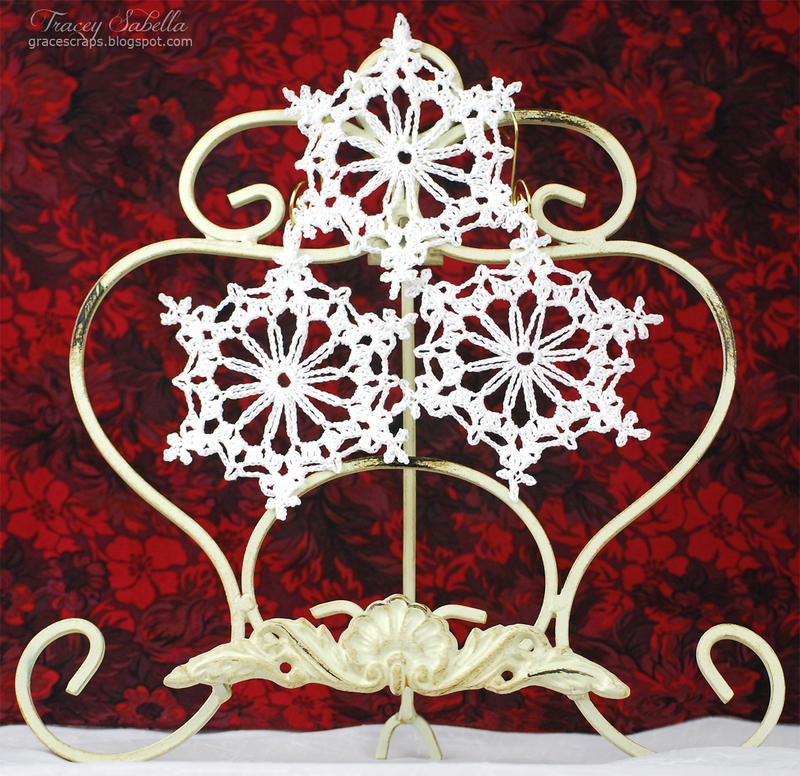 The first step to this project is finding a snowflake sketch or template. I choose to search Google Images for a snowflake template to print. Sized a few different templates, printed and taped my parchment paper over the printed templates. Be sure that you look at your glued snowflake skeleton and see that the branches of your snowflake are full and plump. 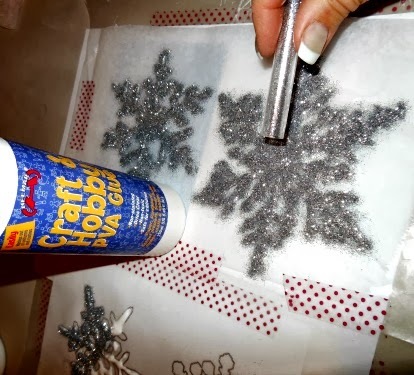 Skinny glue branches on your snowflake result in a failed project, so look closely before you apply the glitter. 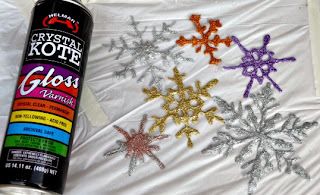 I tested the project and I found that the Helmar Craft and Hobby PVA glue was the best choice for achieving a continuous thick line of glue for a sturdy skeleton snowflake after the glitter was applied and dried over night. 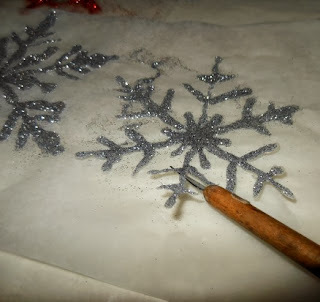 Apply your favorite glitter, dry (overnight) and gently peel away the snowflake skeleton from the parchment paper. After testing the peel away step, i found if you roll the parchment paper away from the dried glued skeleton snowflake, it came off easily. Spray outside, the Helmar Crystal Kote Gloss Varnish to hold the glitter. This project would be great for a SNOW DAY, to keep the kids busy. A bonding project for grandparents and grandchildren. Imagine the possibilities of this Helmar Craft and Hobby PVA glue. Each season you could come up with a craft for each themed event. ie: New Year, Valentines, St. Patrick, Easter, its endless and all from the best glue-- Helmar, Craft and Hobby PVA glue . Add Helmar Craft and Hobby Glue to someone's Christmas stocking this year !! !